Putting Cumbana on the Map–with Ethics | Wait... What? « It’s a light, it’s a bag, it’s a charger! It’s FLAP! We’ve completed our first week of arts and media training with around 55 youth in Cumbana, a coastal community some 450 kms north of Maputo, the capital of Mozambique. 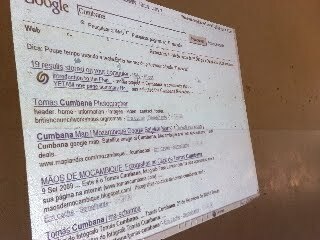 If you ever tried to Google Cumbana, you’d find information about a photographer with the same last name or links to tourist hotels at the nearby beaches in Maxixe or Inhambane, and not much else. We actually did this as part of our Tuesday session on Internet with the youth. Googling New York was another story. But why? We turned it around to the youth. Why is there no information on Cumbana? The conclusion was you only find things on internet that someone puts there, and no one had bothered, no one had ever really uploaded anything about Cumbana. And that meant that this group of youth has a big responsibility, because they are going to be the ones to put Cumbana on the map. Photo: After Cumbana, the top Google search among our small population was, of course, Michael Jackson. What does that mean? Aside from producing arts and media to raise issues that affect them and engage their communities in jointly finding solutions, the youth will be the ones to define Cumbana. As Lauren (the Peace Corps volunteer who’s been teaching at the school for the past 2 years) said: “Did we find anything about you all in Cumbana now on the internet? No. When will there be something about Cumbana? 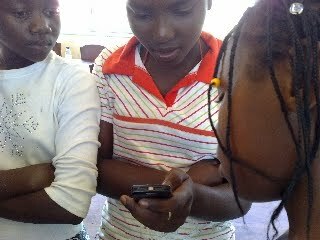 When you make the effort to put it there.” Photo: Mobile phone connections are much more likely than computers in the near future, so we trained on internet also using mobiles. Access to internet whether by laptop using mobile internet or directly on a phone is a huge hit with the kids, 75% of whom had never been online before. Our 2 hour session could have gone on all day for all they cared. The idea of putting yourself on the map seems to have appeal in the same way that having a Facebook page does. It’s about self publishing and creating an identity. Photo left: Anthony the local Peace Corps Volunteer supported with the internet and is working with the theater group. 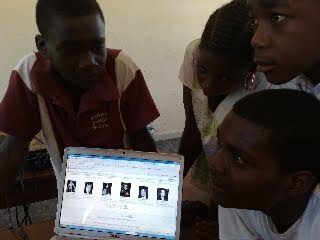 Photo below: Lauren, Peace Corps Volunteer, is working with the multimedia group. The youth were cautioned to leave aside sensationalism. “Often wanting to be the first to get the news out makes us less careful as journalists” Jeremias said. 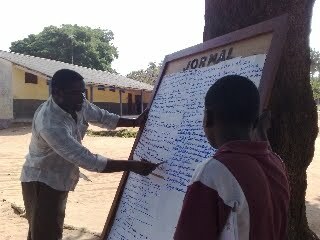 If we drop the bomb, we’re likely to see the next day that we are the ones being processed, accused of not being ethical.” Photo: Jeremias and a youth participant share ideas. “The ethics of a journalist come from within us,” he said. Sometimes even a journalist’s own employers may ask him do things that are not ethical. Or others want a certain story to come out and they try to bribe a journalist. This makes it really difficult to be a journalist. A journalist needs to have high and strong ethics and maintain objectivity,” he told the kids. Jeremias is a wise man and we are really lucky to have him training our group of journalists. Cumbana is the only secondary school (it covers to 10th grade) in the entire district, with 3 sessions a day, serving some 4000 students (if the teacher I asked is correct). The opportunity to participate in a program like YETAM is huge for students and teachers alike. In addition to the journalist group, there is theater, music and dance, multimedia, and painting. For the kids, it’s like a 2 week summer camp where they strengthen leadership skills, improve their studies, get organized to address community challenges facing youth, and think about careers outside of the norm. For the teachers, it’s an opportunity to engage with students in a different way, to strengthen their teaching methodologies and improve their ICT skills. For the partners, it’s an opportunity to give back to the community and, of course, to discover new talent for their professions. on April 18, 2010 at 1:24 am | Reply Meeting in the middle « Wait… What? on May 25, 2010 at 7:45 pm | Reply Demystifying Internet « Wait… What? on June 2, 2010 at 3:58 pm | Reply Youth Empowerment through Tech, Arts, Media « Wait… What?